Atlantic Recycling / News / DAFtastic Additions! 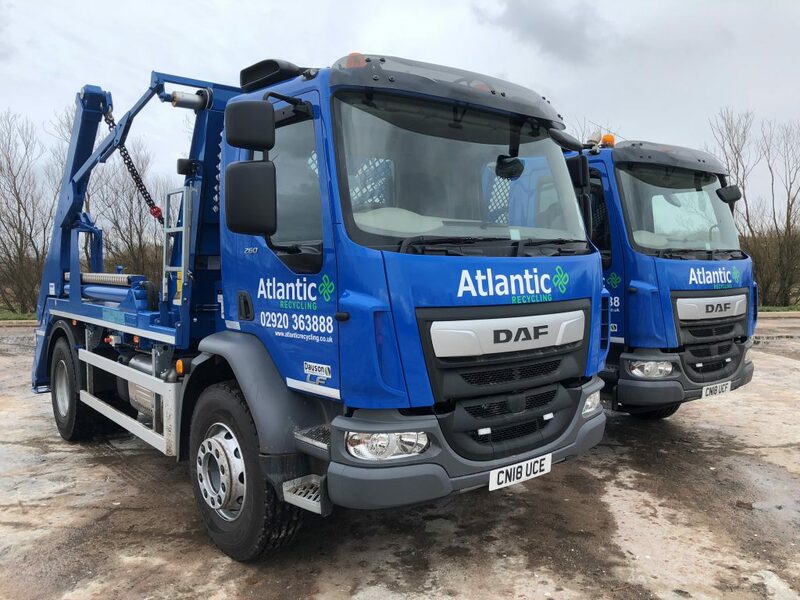 Atlantic Recycling are pleased to welcome the first new DAF skip loaders to the fleet for over 10 years. The trucks, one LF260 running at 18t GVW and one LF320 running at 36t GVW are part of a long-term evaluation and will be used on mixed urban/ city operations and long-distance operations clocking up between 80 and 100,000kms/Yr. Both trucks are fitted with the latest Hyva Telescopic Skip Loading Equipment and automatic sheeting system in addition to a vast array of safety and telemetry equipment such as 360-degree CCTV, proximity sensors, tracking and full engine management. The trucks were purchased from Cardiff DAF Dealer, Watts Trucks with full 3 year R&M package. Atlantic Recycling provide services to trade and domestic clients, including low-cost skip hire, construction and commercial waste collection.